CarGurus has 2,274 nationwide Ram 2500 dealers with 67,024 new car listings. Earlier in the 2019 model year, Ram released its redesigned 1500 pickup truck. In keeping with tradition, the brand also chose 2019 to release a new 2500. The Ram 2500 competes with other three-quarter-ton pickup trucks like the Chevrolet Silverado 2500 HD, Ford F-250 Super Duty, and GMC Sierra 2500 HD. This new 2500 uses the same basic body shell that it did in years prior, but adopts the fresher styling of its baby brother. Like that truck, the 2500’s front end no longer includes the famed crosshair grille. In its stead is one of several giant designs that spells out R-A-M in large block letters. However, the 2500 does retain the power bulge on its hood, which is now made of weight-saving aluminum. At the rear end, redesigned lights give the truck a fresh, modern look. But despite the similarity in profile, the new 2500 includes a litany of improvements, including increased spot welds for a stiffer and stronger frame, new high-strength grades of steel, and a frame redesigned for strength and lightness. The 2019 2500 sheds as many as 143 pounds versus last year’s model, depending on the configuration. Step into the 2500’s interior and you’ll find it to be fresher than ever. It borrows heavily from the modern and upscale setup in the new 1500. Masculine, chiseled shapes make up the entirety of the dashboard. There’s a revised instrument cluster capable of displaying 3D animation on a 7-inch LCD and a new rotary gear selector that smartly groups drivetrain features like hill-descent control, axle-lock, and transfer-case controls. For true power users, the 2500 offers Ram’s 12-inch portrait-oriented touchscreen, which can display one application across the entire screen or be split into upper and lower zones. The new center console features five USB ports and more space, increasing from 19.7 to 22.6 liters. 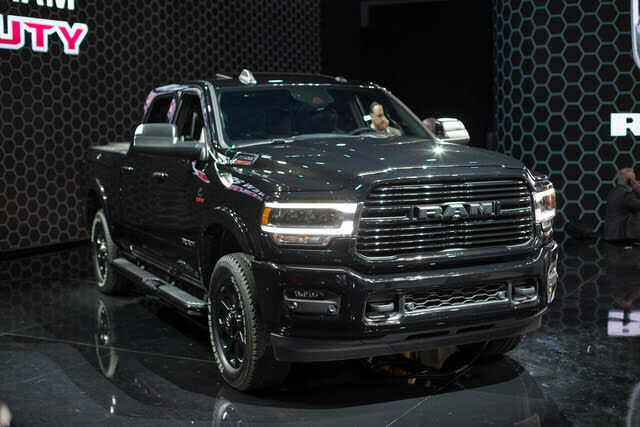 But Ram didn’t just focus on utility here; you’ll also find the new 2500 to be more civilized, thanks to active noise cancellation and acoustic glass that lower ambient cabin sounds by about 10 decibels. The revised climate control system supplies more air and produces less noise than before, and the diesel trims get heating elements for faster cabin warm-up. The new entry-level engine for the 2500 is the carryover 6.4-liter Hemi V8, making the same 410 horsepower and 429 pound-feet of torque as before, paired with a new 8-speed automatic transmission. Those with even greater demands can specify the optional 6.7-liter turbodiesel inline 6-cylinder engine. It carries over from last year’s model, but it gets incremental improvements and weighs 60 pounds less than the one in the old 2500. It puts out 370 hp and 850 lb-ft, the latter an increase of 50. You’ll also get an updated version of last year’s 6-speed automatic transmission. Both engines come with standard rear-wheel drive (RWD) or optional 4-wheel drive (4WD). While payload and towing capacities aren’t yet available, Ram says you can expect improvements including revised and uprated brakes, a redesigned coil-sprung suspension system with frequency response damping, and a new optional rear air suspension with Bed Lowering, Normal/Payload, and Trailer-Tow modes. The 2500’s feature lists were given a similar overhaul for 2019. Keyless start now comes standard on all trims. In addition to the premium 12-inch infotainment system, there’s a standard 5-inch and optional 8.4-inch unit; the latter includes Apple CarPlay and Android Auto. You can also pick from three headlight variations: halogen, full-LED, and full-LED adaptive projector beams. The 2500 even spoils you for choice in the audio category, with four different sound systems, including a 750-watt Harman Kardon setup with 17 speakers. And of course, the brand’s intuitive RamBox cargo management system returns, now sporting a 115-volt outlet with up to 400 watts of power. Ram didn’t leave safety untouched either. 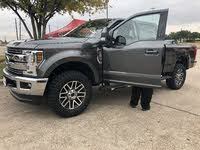 The tire pressure monitoring system now includes the ability to monitor up to 12 trailer tires, in addition to the vehicle's four, while a new cargo-view camera supplements the standard reversing camera. Apart from those, automatic emergency braking and a 360-degree camera system are features that make the list. The three-quarter-ton pickup market is as competitive as ever, but it’s fair to say that Ram brought its A-game with this new 2019 2500. The new looks give it a handsome profile, and the increased levels of comfort and functionality are set to impress. Look for it on dealer lots later this year. What's your take on the 2019 Ram 2500? Have you driven a 2019 Ram 2500? CarGurus has 43,433 nationwide 2500 listings starting at $8,400.